↑ "କାଉନସିଲ ବୈଠକର ନିଷ୍ପତି". ଡରହାମ ବିଶ୍ୱବିଦ୍ୟାଳୟ. Retrieved 8 September 2011. ↑ ୨.୦ ୨.୧ "ଟ୍ରିନିଟି କଲେଜଦ୍ୱାରା ମିଖାଇଲ ଗୋର୍ବାଚୋଭ ସମ୍ମାନିତ". Tcd.ie. Retrieved 3 November 2010. ↑ ୩.୦ ୩.୧ "Reunification Politicians Accept Prize". Deutsche Welle. Retrieved 22 May 2006. ↑ "Mikhail Gorbachev will found new political party". mosnews.com. 13 May 2009. Retrieved 13 June 2009. ↑ "Gorbachev sets up Russia movement". BBC News. 20 October 2007. Retrieved 20 October 2007. 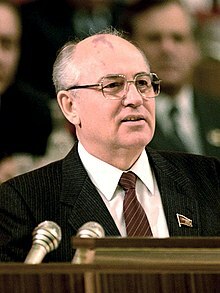 ↑ ୧୦.୦ ୧୦.୧ "Biography of Mikhail Gorbachev". The Gorbachev Foundation. Retrieved 13 January 2012. ↑ "ନୋବେଲ ଶାନ୍ତି ପୁରସ୍କାର ୧୯୯୦". ନୋବେଲପ୍ରାଇଜ.ଅର୍ଗ. 15 October 1990. Retrieved 3 November 2010. ↑ "The Peace Abbey Courage of Conscience Recipients List". Peaceabbey.org. 20 November 2005. Retrieved 3 November 2010.